Iowa's Connor McCaffery goes for a layup - Photo by Jason Schott. 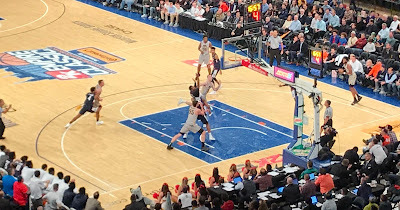 Iowa won the 2K Empire Classic on Friday night at The Garden with a 91-72 win over UConn, while Oregon rolled to an 80-65 win over Syracuse in the consolation game. Iowa was led by Tyler Cook, who had 26 points on a superb 10-14 from the field, with 8 rebounds and 2 assists. Luka Garza had 22 points, including 18 in the first half, on 7-14 shooting, including 2-5 from behind the arc, with 6 rebounds. Connor McCaffery poured in 19 points (5-8 FG, 9-11 free throws) off the bench, with 5 assists and 3 rebounds. Iowa came out firing, as they jumped out to a 12-4 lead on an Isaiah Moss three-pointer at the 13:46 mark of the first half. Their biggest lead came on another Moss three at 7:24 when they opened up a 17-point edge, 31-14. UConn bounced back, as a layup from Kassoum Yakwe at the 3:33 mark pulled them within 10, at 34-24, but Iowa closed the half on a 9-3 run to go into the half up 43-27. Iowa kept dominating throughout the second half, and they opened up a 25-point edge, 72-47, on a Cook dunk with 7:04 remaining. But, this is college basketball, where no lead is safe. UConn reeled off a 14-2 run over the next three minutes, capped by a Jalen Adams layup, to make it 74-61 Iowa. Iowa didn't break, and they went up 15 on a dunk from Cook with 2:28 left that made it 83-68. There were some fireworks at the end, as UConn Head Coach Dan Hurley was ejected with 1:44 left when he took his second technical foul, and UConn did not appreciate Ryan Kreiner getting a meaningless dunk with four seconds left instead of classily dribbling it out. UConn was led by Jalen Adams, who had 20 points (8-18 FG, 2-6 threes), with 2 rebounds and 2 assists. Eric Cobb had 16 points on a superb 7-8 from the field, with 7 rebounds. Alterique Gibson had 12 points on 5-14 from the field, with 5 rebounds and 4 assists. In the battle of ranked teams, #15 Oregon walked out of New York with one win in two tries, while #13 Syracuse left without a win, as they were soundly defeated by UConn and Oregon. Oregon was led by Bol Bol (yes, Manute's son), who had 26 points on 11-17 from the field, and 1-2 from behind the arc, with 9 rebounds, 1 assist, and 3 steals. He had 14 points an 7 rebounds in the first half to help Oregon jump out to a 35-22 edge at halftime. Oregon Head Coach Dana Altman said of Bol, "He's a unique talent and he's going to grow into a special player, because you saw him shoot the three, you saw him handle it, he made some nice passes; we do have to get him stronger. He's got to play the game as more of an athlete, rather than straight up and down...When you're straight up and down, everything seems to be moving a lot faster and seems a lot more physical than it is. He's got to be lower and a better athlete. He's a really good athlete , but when he's straight up and down everybody pushes him around. He's going to figure all these things out and he's working with us, he wants to be a good player and he's unique. At 7'2 to do the things that he can do, you saw that soft touch, that zone, the jump hooks and that ball just lays on the rim. He's got a very soft touch for 7'2." Syracuse Jim Boeheim said of Bol, "He's a good player, he's big, he's tough. He's very good. He's a big problem out there. We're not physical. We have to be a lot more physical with him. He's got a great touch. I think that's the biggest thing...He has a great feel for the game. He's a good passer and he's a good scorer. He can shoot from the perimeter, he can shoot from the high post - that's a great combination." Oregon also got contributions from Payton Pritchard, who had 18 points (4-5 FG, 2-3 threes) with 5 rebounds and 4 assists; and Kenny Wooten had 12 points on 3-6 from the field, with 6 rebounds. Syracuse was led by Tyus Battle, who had 17 points (4-10 FG, 0-4 threes, 9-10 free throws), with 3 rebounds and 2 assists. Elijah Hughes and Jalen Carey had 14 points apiece, while Oshae Brissett had 11 points, 6 rebounds, and 4 assists. Syracuse shot just 35.3 percent (18-51) for the game, including 17.9 percent (5-28) from behind the arc. Boeheim said of their offensive struggles, "We tried things but none of them seemed to work very well. We tried different sets, different movements, different perimeter things, subbing people out, setting ball screens and all of those things. Sometimes if the ball doesn't go in, none of that works. None of that works. What we did last night, because we weren't making shots, we got to the basket. You're not getting to the basket against Oregon...at the end of the day you have to make some shots from the perimeter."